A lively Twitter conversation between CIMSEC members Chris Rawley, Claude Berube, and Ryan Mewett regarding the nature of a Navy, specifically whether or not the Sea Shepherd Conservation Society’s (SSCS) fleet constitutes such a force, inspired the following debate. Mr. Rawley and Mr. Berube have taken the affirmative position while Mr. Mewett has taken the negative position. A rarely asked but fundamental question is: how do we define a navy? The answer might appear to be self-evident. Merriam-Webster defines a navy as: the part of a country’s military forces that fights at sea; a group of ships; a nation’s ships of war and logistic support; and the complete naval establishment of a nation including yards, stations, ships, and personnel. But are these criteria accurate or sufficient in the twentieth century? The authors assert that under a more appropriate definition, the maritime arm of the Sea Shepherd Conservation Society (SSCS) is a navy. How does Sea Shepherd meet those criteria? “…a group of ships…” Certainly Sea Shepherd meets this first criteria. It operates a fleet of ships that include former U.S. Coast Guard cutters, a former weather survey ship, a former fisheries protection ship, and others. But a “group of ships” could also allude to a commercial shipping fleet or even a cruise line. “…yards, stations, ships and personnel…” Sea Shepherd has paid staff as well as thousands of volunteers operating globally. “…forces that fight at sea…” Although its ships have operated for forty years, the organization gained notoriety with its operations in the Southern Ocean, chronicled on cable television’s “Whale Wars.” Sea Shepherd ships searched for, located, pursued, and challenged Japanese whaling ships. Elsewhere, Sea Shepherd has worked with countries and even Interpol. During Operation Thunder, SSCS vessels chased an illegal fishing trawler 10,000 nautical miles, until the ship was scuttled off the west coast of Africa and the violators were brought to justice. Taken collectively, the above three criteria suggest that Sea Shepherd has a navy, but perhaps the most important traditional component of the above definitions is that a navy must be an arm of a nation. State recognition may not be a necessary criteria in the 21st century. For example, Israel and Taiwan both maintain navies. But 31 United Nations member states do not recognize Israel as a nation, and only 21 UN member states recognized the Republic of China (Taiwan.) Does this mean Taiwan’s 116 ships do not constitute a navy to countries that do not recognize it? Does this mean Israel’s eleven corvettes and missile boats, five submarines and forty-five patrol boats do not constitute a navy in the eyes of countries that do not recognize it? Indeed, the United States’ own history suggests that one need not be a recognized national entity to maintain a navy. No country immediately recognized the legitimacy of the thirteen colonies. Though there was a Continental Navy, the Continental Congress as well as states authorized letters of marque to privateers and several states created their own navies. At first, the navy relied on converted merchant ships until warships could be built from the keel up. The same has been true for Sea Shepherd which had – until this summer – relied on purchasing former commercial or governmental ships. This has changed with the M/Y OCEAN WARRIOR, their first purpose-built ship built from the keel up at Damen Shipyard. The fundamental issue of a national navy in the twenty-first century may not exclusively be a nation of borders which often contains conflicting political views, but might also include an international organization of like-minded individuals who seek policy changes that are effectively executed through its maritime branch. What is more important than borders, the traditional definition of a nation, is that an organization have legitimacy. Sea Shepherd is a non-profit organization with offices in numerous countries and authorization to operate out of a number of foreign ports, such as those in Australia. Sea Shepherd derives its legitimacy from the countries that support or condone it. It has now operated with several countries (Ecuador, Sao Tome and Principe, Gabon and others) to serve as a maritime law enforcement agency. And, as noted earlier, it has worked with Interpol on at least one major operation. SSCS has also been subject to litigation for their actions, but so have more traditional navies and their representatives. To fund the OCEAN WARRIOR, Sea Shepherd received money through the Dutch Postcode Lottery, after competing with other organizations. Sea Shepherd isn’t alone in this new breed of non-state Navies. The Migrant Offshore Aid Station, or MOAS, stood up in 2014 to rescue migrants in the Mediterranean Sea. Since then, the organization’s professional and volunteer crews, along with their two ocean going vessels, Schiebel S-100 camcopters drones, and small boats have rescued more than 24,000 people in the central Mediterranean and Aegean seas. Earthrace Conservation, founded by former Sea Shepherd member Pete Bethune and staffed by former special operators, has also conducted wildlife protection missions in conjunction with a number of foreign militaries and maritime law enforcement agencies. Earthrace is currently crowd-funding the construction of a new sea-going fast patrol trimaran. One of the distinguishing characteristics of navies from coast guards is that navies perform missions in support of global interests. Many navies do not or rarely conduct blue water operations and have more regional interests – or simply do not have the political will or financial ability to operate globally. Ships are certainly the core of a navy, but without the funding, logistical support, and perhaps most importantly, trained professionals, they are dead in the water. 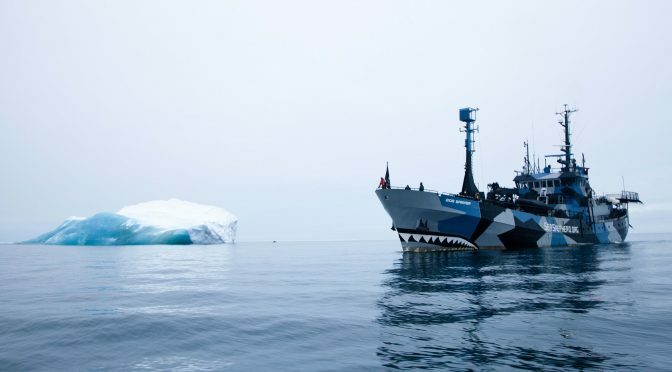 Sea Shepherd refers to their missions as “direct action,” which is not analogous to combat, as their objective is to protect wildlife rather than pursue violent clashes with other naval forces. However, SSCS tactics – which include disrupting other vessels and boardings (sometimes with host nation military riders embarked) – are analogous to maritime security and presence missions common to many navies in peacetime. Sea Shepherd operates its ships in the Southern Ocean, the Pacific, the Mediterranean, and the Atlantic. Sea Shepherd has an order of battle – an ocean going fleet – of at least eight vessels. Its volunteer crews often make several multi-month voyages, giving them more at-sea experience than many navies whose sailors may make one or two deployments before returning to civilian life. Only the largest of the world’s navies routinely operate aircraft off their ships. SSCS’ small naval aviation arm consists of a variety of unmanned air systems and helicopters and is vital for over-the-horizon scouting during open ocean pursuit missions. While the definition of a navy may be debated, the fact that Sea Shepherd has a fleet that conducts global operations to promote or enforce policies and has gained legitimacy from nations suggests that it qualifies as a navy. Moreover, as Sea Shepherd and other like-minded organizations continue to expand and professionalize, the likelihood that they will engage – either positively or negatively – with traditional nation-state navies will increase. The Sea Shepherd Conservation Society is an organized, committed activist group and a noteworthy non-state actor with coherent political objectives and worldwide reach. It operates a fleet of nine vessels with varying operational capabilities on missions around the globe. Best known for its depiction in the reality television series Whale Wars, SSCS conducts operations ranging from cooperation with coast guards and constabulary navies in fisheries enforcement to harassment and attempted interdiction of whaling vessels. Last year, two SSCS vessels pursued a trawler with a history of illegal fishing for over three months, covering more than 10,000 nautical miles of ocean before the trawler sank, likely scuttled by its crew. 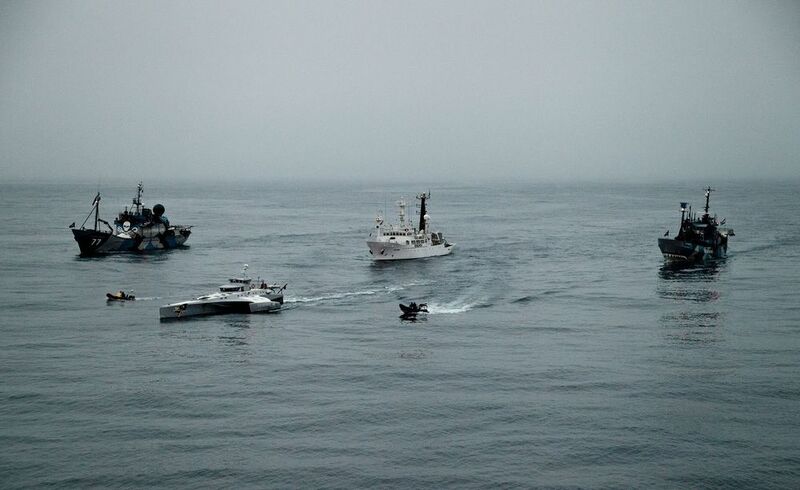 During the chase, the SSCS crews demanded the suspect vessel stop fishing, threatened law enforcement action, and ultimately prevented it from fishing by cutting its nets. 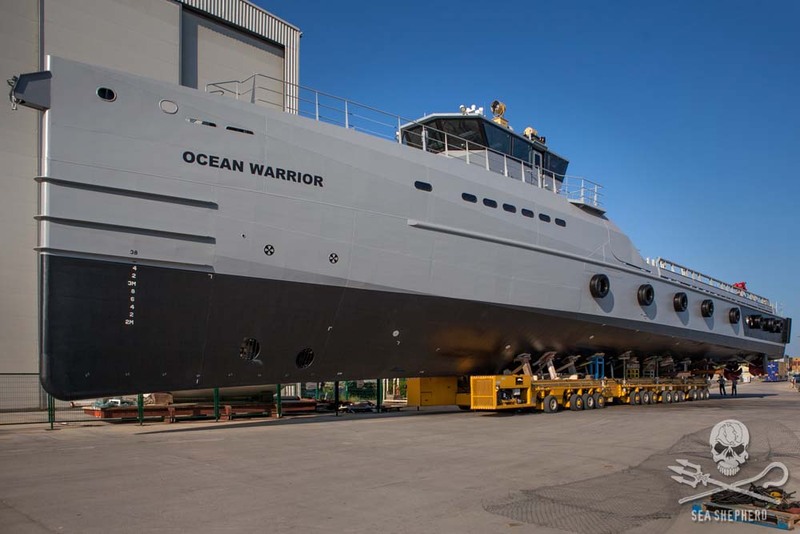 The recently launched MV Ocean Warrior, the organization’s first purpose-built vessel, is reportedly capable of speeds of up to 30 knots, may support helicopter operations, and is scheduled for its first anti-whaling operation to begin later this month. For all this, Sea Shepherd’s fleet is not a navy. I propose that each of these attempts at definition contain necessary attributes of a navy, but only Rodger’s includes the crucial point: a navy fights. Any plausible definition of a navy will include a variety of descriptions on the nature of the organization and its objectives, but I challenge the reader to define it in a way that both includes organizations that obviously are navies and excludes organizations that clearly are not without reference to this fundamental – and the burden of a positive definition must lay with those who would class Sea Shepherd’s fleet as a navy. In the same vein, a seagoing organization– in addition to being organized, having hierarchical command and control, pursuing political objectives, as well as perhaps having other characteristics not discussed – must have the capability to fight to be truly classed as a navy. That fighting capability is what permits the navy to exercise the core function from which other roles stem: to exert some level of sea control, on a scale from outright command to simple denial, in pursuit of political objectives against a competitive, capable opponent. An actor whose ultimate recourse is to another legitimate authority that truly will use force cannot credibly be said to exercise sea control. The Tamil Tigers had a navy. The Sea Shepherd Conservation Society does not. Continue the conversation on Twitter using the hashtag #whatisanavy. Claude Berube teaches at the United States Naval Academy. He has published three non-fiction books and two novels. Follow him on Twitter @cgberube. Captain Chris Rawley is a surface warfare officer and entrepreneur. Follow him on Twitter @navaldrones. Ryan Mewett is an active duty submarine officer in the United States Navy. Follow him on Twitter @REMewett. The opinions and assertions contained herein are the private opinions of the authors and are not to be construed as official or reflecting the views of the Department of Defense, the United States Government, the U.S. Naval Academy, or the United States Navy. Could ‘militia’ be the most appropriate term here? Well, Josh, it was me who chose that term – not Sea Shepherd, Dr Alex Schmidt Counter Terrorism expert, Uncle Tom Cobley or anyone else. Does that make me potentially violent? non-state actor, 9th circuit court used the term ‘pirates’, which may not be the correct definition either. Comments by Capt. Watson are notable as he assumes the title of “Navy”, hence subjecting the operations under the Laws of the Sea. Regardless, the TV show is entertaining. Interestingly, the “affirmative” description above is worryingly applicable to pirates or marine terrorists. One man’s pirate is another man’s hero. John Paul Jones, the founder of the United States Navy was labeled a pirate by the British Admiralty. Does that make him a pirate? Henry Morgan became governor of Jamiaca. Did that negate his piracy? Robert Surcouf was given the Legion of Honor by Napoleon. Jean LaFitte defended New Orleans shoulder to shoulder with Andrew Jackson. In many respects being considered a pirate is a subjective thing, Were the pirates of the Caribbean any less pirates than the looting murdering conquistadors from who they stole the gold. Am I more of a pirate because I was called a pirate by a U.S. Federal judge than the Japanese whalers who were found guilty of crime at sea by the International Court of Justice. A judge may have called me a pirate but I was not charged with piracy nor am I wanted for piracy. The whalers on the other hand had a verdict of guilty delivered to them. Utter tosh. Would shooting flares at policemen in inflatable boats constitute non-violence, in your view? interesting that my first thought about the picture of the “motor yacht” OCEAN WARRIOR is that the bow appears to be a purpose-designed & reinforced ram. I was not aware of their history before having that thought, but a little reading has confirmed that observation in my mind. I’ll have to pay attention to the news over the next 6 months or so. I’m not sure which reading you did, but the bow is a standard part of the standard design that Ocean Warrior was built to. Have a look at the Fast Crew Supplier 5009 (link below) – it’s the same boat. I very much doubt that she needs a ram bow for servicing oil rigs, it is just for good sea-keeping in rough weather. They used to have a ship – the Farley Mowat – with a reinforced bow, specifically designed to pierce through other ships hulls… hence the nickname: “the can opener”. In 2006 they sideswiped the tanker Oriental Bluebird.As an excuse they used that it was being used to refuel Japanese whaling vessels. the reading I referred to was Sea Sheperd’s history of ramming other vessels. Dibs on Nisshin Maru anyone? Eh, couldn’t resist. But Captain Watson did have a point, that ship would be of more use to the oceans as a reef! We call it Neptune’s Navy. Sea Shepherd is not a protest organization. I established it in 1977 to intervene against illegal activities. We presently have nine ships, dozens of small boats, numerous drones and helicopters. Presently we have 125 crew from some 25 different nations on the ships. We have hundreds of shore crew and tens of thousands of supporters. We have one ship working in partnership with the Mexican Navy in the Gulf of California to protect the endangered Vaquita and the totoaba fish. We have one ship patrolling the waters of Gabon with 10 armed Gabonese sailors onboard to intercept unlawful fishing operations. We have a partnership with the Ecuadorian Federal police and the Galapagos Park rangers to protect the Galapagos Marine Reserve. We have a partnership with the police in Sicily to protect the Sicilian marine reserves. We have crew on the beaches of Costa Rica working with the police to protect sea turtles. Sea Shepherd is about enforcement in partnership with governments in national waters and operating under the guidance of the U.N. World Charter for Nature in International waters. We have also worked in the past with the Senegalese Navy, the Trinidad Coast Guard, the Nigerian Navy and the Indonesian Navy. In the past Sea Shepherd has engaged in confrontations with the Soviet Navy off Siberia in 1981, the Portuguese Navy off Portugal in 1979, the Norwegian Navy off Norway in 1994, the Canadian Coast Guard of the East Coast of Canada in 1979, 1983, 1993, 1998, 2005 and 2008. Since Sea Shepherd was established in 1977 we have rammed more ships, sunk more ships, boarded more ships and blockaded more harbours than most of the world’s Navies. Most importantly Sea Shepherd has shut down more illegal whaling, sealing, turtle poaching, fishing and habitat destruction operations than any other marine oriented NGO. And as a final note we have an unblemished record of not causing nor sustaining any losses or injuries. We call our approach “aggressive non-violence” and we consider our most important tactical weapon to be the camera. Whatever the debate, we consider ourselves to be a Navy for the Ocean. It may be a long long time before any one nation re-tasks it entire Navy, Coastguard and Merchant Marine for the sole purpose of protecting the oceans. Re-tasking is difficult. It requires educating the minds of bureaucrats. That leaves the field wide open for volunteers with a passion for doing good. It looks like that vacuum is already being filled by the SSCS. a. Are you subjected to the laws of war (sea) fare? And hence accept that you are lawfully sunk by another Navy, if you interfere with the sovereignty of a state? c. how to you delineate between non-violence and aggressive non-violence to ensure non-violence does not cross over into violence at the loss of life? Or is the loss of life an accepted concept under the category “collateral damage”. Sea Shepherd is a navy, a navy that does what all of the countries’ navies in the world are too apathetic, corrupt, and / or impotent to do. The oceans need protected for all our sake, and apparently, Sea Shepherd is the only navy in the world who gets that, and has enough balls to do it. Exactly! You took the words straight out of my mind. Oh so much warfare and so many territorial disputes on the seas, yet the seas belong only to the lives that are in them, which, in turn, sustain ALL life on earth. Sea Shepherd is fighting for life on Earth. And I agree. Just because Sea Shepherd isn’t a “nation” doesn’t mean it can’t have a navy. Exactly! Just like the Somali pira… erm, navy! Sea Shepherd’s Neptune’s Navy is protecting and defending the Ocean ecosystem from the illegal poaching and killing of sentient Marine Mammals. Unlike the U.S.Navy, it does not attack or use agressive weapons such as dangerous Sonar or Electromagnetic Radiation testing,( RIMPAC) that is killing and deafening whales and dolphins around the world! Sea Shepherd has it’s “Neptune’s Navy”, the first Navy in history that fights for and defends the citizens of the sea. It has no nation’s support or funding, only committed volunteers that care more about protecting the oceans and it’s inhabitants because no nation will. It now has an amazing ice breaker ship that will continue to thwart Japan’s illegal whaling. Although some valid consideration is being made, the point of “when the ocean dies, we die”, is an evolutionary perspective and somewhat moot if we think about it. Death by definition is a given. Not to disrespect the noble cause and greater purpose, but….I am concerned about the radicalization of the debate and drawing the line between non-violent and extremism. Once the line is crossed your noble cause loses credibility, since preservation of human life to avoid the “we die” point. How is the Faroese government a terrorist government? You fail to see the reasons for Sea Shepherd Maritime use ! They are trying to help PROTECT THE MARINE LIVES ! Some of them are on the ENDANGERED SPECIES LIST ! Some of them are about to become ENDANGERED ! Other NATIONS have asked for their help ! They work side by side with FOREIGN COUNTRIES ! They are also cleaning up our OCEANS & SHORES , that we have POLLUTED ! Praying your not an ILLEGAL FISHERMAN ! It is according to the Corbett definition of a “fleet in being” –which is all about defending things. See Some Principles of Maritime Strategy, Corbett, Naval Institute edition, page 212. Great article as always gentlemen. Thanks for posting. One other aspect of the Sea Shepherd’s operation to consider is the international legal responsibility that the United States and foreign governments who actively contribute to the Sea Shepherd’s activities might incur. Last year the Sea Shepherds bought 2 former US Coast Guard 110 ft cutters from GSA at an Annapolis, Md auction. The Sea Shepherds’ Ocean Warrior ship was built iby a Dutch company (Damen)n a Turkish yard with Dutch funding (I believe) as well. What happens legally if for example, a Japanese crewman is killed as a result of the anti-whaling activities of these ships and their crews in Sea Shepherd activities? History provides a chilling example. As you know, the Confederate raiding fleet composed of British built and crewed ships like the “Alabama”, “Florida” and “Shenandoah” inflicted severe damage on the US Merchant and whaling fleets over the course of the American Civil War. After that conflict (1869), the United States sued Great Britain for damages resulting from the depredations of these Confederate cruisers that were built in British yards with UK govt. knowledge. A board of arbitration agreed with the US and awarded it $15.5 million dollars in damages. That sum is the equivalent of $304 million dollars in 2015. 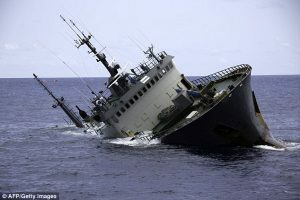 The example of the “Alabama Claims” could serve as a legal example for injured parties seeking damages due to Sea Shepherd activities. The Netherlands, Turkey, Australia, New Zealand and the United States could all be held legally accountable for such damages. Also, the US 9th Circuit Court of Appeals defined the Sea Shepherds as “pirates” in a 2013 ruling against the group’s U.S. activities. The combination of the Alabama claims with the 2013 9th circuit ruling sets up the case for any injured parties seeking to sue govt’s that have contributed to or actively condoned/supported Sea Shepherd activities. Thanks again for your most informative post. Perhaps the final determination of what constitutes a “Navy” lies with govt. recognition of such. In the Civil War, as you probably know, neither the UK nor France could be persuaded to recognize the Confederate states as a “co-belligerent” with the United States. The Confederates remained a rebel, non-state actor in terms of legal status as a result of this UK/French decision. To my knowledge, no nation has so recognized the Sea Shepherds. The legal status of the former Czarist Navy ships that were interned in the French port of Biarritz might also be an example. That is not an entire correct position. A grieving party could apply the U.S. RICO statute and other applicable state laws as seen in the case of Greenpeace. The grieving party, a Canadian company applied for federal Mafia laws against Greenpeace International based in The Netherlands. Food for thought. Not entirely factual. The Canadian case was dismissed on a technicality and the U.S. case is still on-going. But that’s diverting from the subject. Again, no disrespect, since you referring to the quote of one “freedom fighter, is another men’s terrorist”, isn’t this exactly the “red line” of crossing from non-violence to violence? This said, since you are a navy (sort of), distinctively marked in war paints, you listed a long list of successful sinkings and ramming actions, you would accept you are subjected to laws of (sea) warfare? So boarding by another navy would be acceptable and an accepted risk? This is interesting but i thought the original debate was about the legal standing of an official ‘navy’. Just because you agree with their actions doesn’t mean they must be a navy. In describing a group that seeks to uphold laws that aren’t well enforced perhaps vigilantes is more appropriate. Or activists if you seek a softer term. To me they are the world’s best navy exposing illegal activities that harm the oceans we all depend upon. They film illegal fishing and whaling activities where other countries are afraid to. They remove illegal fishing nets before those nets can kill even more ocean creatures. They work directly with the navies of other sovereign nations such as Mexico and Gabon to help expose illegal fishing practices at the invitation of the navies of those sovereign nations. If the Oceans Die, We die. Please support Neptune’s Navy. Sea Shepherd is a Navy. A Navy for good! It’s bizarre that an NGO like Sea Shepard is the main player in a fight we all have a huge stake in ie. Preserving the oceans wildlife and ecology. Apart from the humanitarian issue If we lose the oceans we lose a resource essential to our survival. Where are the global governments and multinational corporations in this issue? Mostly striving to destroy what Sea Shepard and other groups are fighting to preserve. 100% they are a Navy. This reminds me of the classic essay question asking students to discuss, ‘One man’s terrorist is another man’s freedom fighter’. The debate in this article is about definition. It can be dangerous to argue from a dictionary definition, but it is a starting point. The Oxford English Dictionary defines the word navy as: ‘The branch of the armed services of a state which conducts military operations at sea.’ It is this strict definition that forms the basis of Mewett’s argument and in the strict sense Sea Shepherd is not a navy. But are they a non-State navy, as Berube and Rawley argue? Historically there have been private navies, but these operated under ‘letters of marque’ given by a State and example being the Bombay Marine operated by the British East India Company. They did this to avoid being charged with piracy as they pursued their policies. Sea Shepherd has no letters of marque so is not formally a private navy, but are they pirates for operating without a letter of marque? One judge in a US Circuit Court did rule that they are pirates based on Merriam-Webster dictionary definition, and the meaning of ‘private ends’ in the international Law of the Sea but the weight of legal opinion is that he erred and that Sea Shepherd are not pirates. However, could Sea Shepherd be considered functionally as a private navy? This is where Berube and Rawley seem to largely argue toward. The letter of marque is a historical term and as they point out in their Post-Westphalian approach, non-State actors are gaining increasing legitimacy, recognition, and reach. For example the nine largest private armies in the world are run by US and UK corporations. Berube and Rawley do argue very well that in today’s world Sea Shepherd can be considered functionally a non-State actor navy, but I think they fall down in trying to argue that the central tenet of the definition of navy, that it is an military organisation of a Nation State, does not apply to Sea Shepherd. In a strict sense and from a narrow military perspective Sea Shepherd is not a navy (Mewett’s argument), but from a functional perspective in the current world the can be considered to operate as a navy (Berube and Rawley’s argument). I would suggest they could be considered a modern private navy whose clients are, as Watson has said, the whales, dolphins, sharks, and other sea life around the world. I don’t care what Sea Shepherd is defined as. They are doing what all nations ought to be doing…protecting the oceans and targeting illegal trawlers, fake research vessels and stupid ‘traditions’. Mr. Mewett defeats his own argument, namely in his description of naval historians’ (Mahan and Rodger) writings on the topic. He describes Mahan’s position as being essential for ensuring safe conduct of commercial traffic at sea, while Rodger’s position is described as a permanent fighting service designed for war. I would hardly say that the primary, or even secondary function of a navy is to ensure smooth commercial traffic. Sea Shepherd Conservation Society most definitely has a navy. It has a fleet of ships, with an organized personnel structure and hierarchy, and it sails on behalf, at the invitation, or with the informed permission of various countries around the World. It sets out on prescribed, planned missions engaging its enemies wherever and whenever they are encountered. It might not employ lethal force in its fighting, but fight it most certainly does (which is evident after viewing even but a single episode of the sited tv show Whale Wars.) You might classify the organization as eco-terrorist or not, but either way it is an organization with a navy at its disposal. Sea Shepherd is doing what Governments should be doing, Protecting the Ocean and the Marine life in it. Defend Protect Conserve! Sea Shepherd (Neptunes Navy) is the only compassionate enough movement to make any differeence in the oceans all over the world. I am proud to say that I am involved, and proud Captain Watson, and each anevery member onshore, and offshore.. Sorry typo Devend Conserve Protect, that’s the motto. Think about it… who else does this? NOBODy! I would call it ‘People’s Navy’. People who care (as opposed to the plenty who sleep walk through life). In a strict traditional sense SSCS is not a navy. In a forward looking and broader sense they definitively are! An international organisation like the UN could (and should!) have a navy to protect international waters from pirates, killers, poachers, murderers and other criminals like polluters. In the absence of such a navy protecting all earthlings, a large international NGO like SSCS can fill this terrible void. Traditionally, a navy was a military operation. Today, the definition includes militant operations for the protection of the earth’s seas. Hence SSCS is the world’s most meaningful and important navy which should have the full support of all ethically responsible humankind! It’s disgusting that the Sea Shepherd Navy is the only Navy doing anything to save our oceans and the species in them. I’m disgusted that the worlds countries Navies are sitting on their asses, watching Humanity destroy the oceans, decimate the species within and waiting for them to be completely empty before deciding to participate….. when it’s too late. What could be more important than saving this planet, saving all species and in the end, maybe saving Humanity from itself??? Under what laws, articles of employment, or contract to the sailors or volunteers sail on the Sea Shepherds ships? If captured do they fall under the Geneva Convention or any other legal definition of naval combatants. do they wear uniforms or have arm bands that ID’d them as members of the Sea Shepherds? If not could they could be summary executed if caught on the battlefield, again this would require definition of the sea as a battlefield. Sea Shepherd crew do wear uniforms that identify them as members of the crew. When working in partnership with an authority they work under the auspices of that authority. Presently that is Ecuador, Mexico and Gabon. When in international waters the crew work in accordance with the principles established by the U.N. World Charter for Nature. And of course the ship’s officers and crews are answerable to their flag which includes the Netherlands, Australia and the United States. Just another NGO in search of a cause.